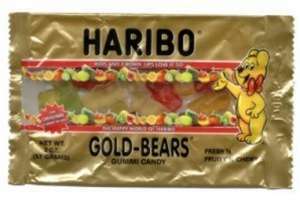 Haribo Gummi Bärchen (that's German for gummy bears) are a long time favorite of all ages and a top seller for band, choir, foreign language, or any organization setting out on a fundraising project. The bears come in many fruity flavors and colors. They are very tasty and fun to eat, and because of the fun shape of gummi bears; you are even allowed to play with them a little bit before you eat them! They are tastier than the gum drops one finds here in America.